This year’s Marrakech International Film Festival has paid tribute to the Scandinavian cinema. Nicolas Winding Refn, Mads Mikkelsen, Noomi Rapace, Lisa Langseth, Susanne Bier, Tobias Lindholm and Baltasar Kormakur were among the star-packed delegation of Scandi helmers, thesps and producers to hit the Marrakech film festival’s center stage for a tribute hosted by jury president Martin Scorsese. 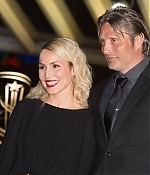 Noomi has also attended the Scandinavian Party as well as a tribute to Fernando Solanas. All pictures have been added to the gallery.